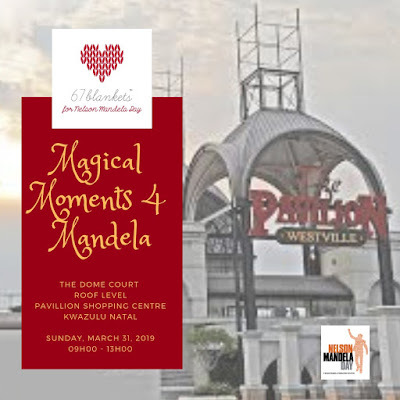 NB: The venue has changed for the Durban event: This will now take place at The Dome Court, Pavilion Shopping Centre on March 31 from 09h00 to 13h00. 67 Blankets for Nelson Mandela Day celebrate their sixth year of knitting the country together in warm displays around the country by creating Magical Moments 4 Mandela. The 67 Blankets for Nelson Mandela’s Magical Moments will take place on March 31, 2019, where all blankets made this year will be exhibited and laid out from 09h00 to 13h00, simultaneously at various venues around the country. Following the Magical Moments 4 Mandela, the blankets will be distributed to those in need. This year the blankets will be delivered earlier to ensure that recipients are kept warm from the first chilly morning to the last late frost. In Johannesburg, the blankets will be laid at Nelson Mandela Square, Sandton, at both the Nelson Mandela Statue and the newly unveiled 1m-tall replica of the Nelson Mandela Statue, which is located close to the original. The replica is modelled by the original artist and sculptor Kobus Hattingh and designed specifically to allow the visually impaired to experience the statue in their own way. For this, 67 Blankets will be working closely with the Johannesburg Society for Blind. The other gatherings will take place in Cape Town, Pringle Bay, Port Elizabeth, Pretoria, Bloemfontein and Durban. KnitWits and anyone donating blankets to this initiative should hand over their blankets by March 22 2019 to Ambassadors in the area. “This responds well to our effort to ensure that Mandela Day action is taken every day. We are delighted that the 67 Blankets Initiative is collecting blankets early this year in preparation for the punishing winter”, says Yase Godlo, Mandela Day Manager at the Nelson Mandela Foundation. “Such acts of kindness are the reason we are inspired to do more to impact positively towards people’s lives”, he added. “This is the sixth year we will be laying down our beautifully knitted and crocheted blankets. It is incredible to see how this movement has galvanised so many people and communities. Each blanket laid down in these exhibits is a visual reminder of the care and goodwill so many people from South Africa and around the world have for their fellow men and women. Stitch by stitch we keep the legacy of Madiba alive, bringing hope, comfort and warmth to others,” says Carolyn Steyn, founder of the 67 Blankets initiative. “We do not wait until Mandela Day in July to distribute blankets to those in need. We follow the lead from the Nelson Mandela Foundation to make every day a Mandela Day and respond to the needs of the people,” she adds.